At flows above 1,000cfs this can offer up fun play for locals via the fish weirs visible at lower water. While many surf options exist at these flows, there isn't one with a service eddy! Mind the bridge at these flows. Although this run can be done down to 250cfs it isn't recommended much below 400cfs due to negative interaction with fisherman in this crowded fishing section. You can also continue past the takeout all the way down to the putin for the upper blue for miles and miles of class II drifting with frequent low bridges. 6/12/2017 - I ran this @ 1500 CFS and put in right below the damn on River Rd in Silverthorne and we floated to Blue River Campground. We were 2 people in packrafts. The bridge @ 6th street was a tight fit, but we didn't scrape our helmets with maybe 1,2 inches to spare. If flow is lower, it should be no problem in a packraft and maybe even a kayak or a SUP if laying on your belly. Bigger boats should put in downstream from that. There is indeed no big/scary feature on this stretch, a few fun train waves and at this flow we took a right branch at one time which had a mandatory tight S maneavuer to avoid a log that was from the shore (river right) to river center. We did this stretch which is about 10 miles of river in 1h 15 min. It was lots of fun and the water was crystal clear, but cold - so dress accordingly. 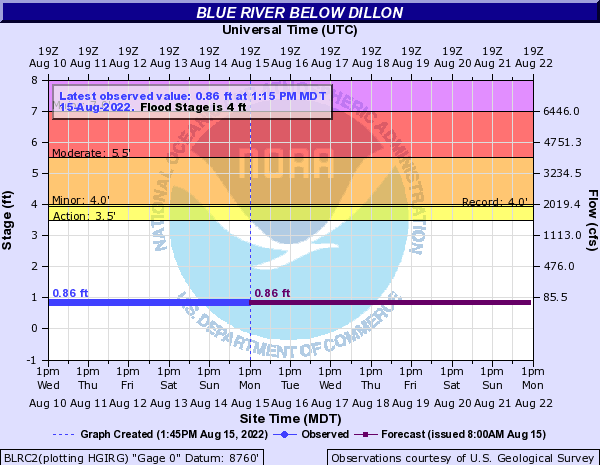 Primary Gauge BLUE RIVER BELOW DILLON, CO.
From Silverthorne Outlets drive towards the dam as far as possible. Park near baseball fields. Park by the library. Take out using the stairs just downstream of the library. The bike path goes through this lot if running bike shuttle.